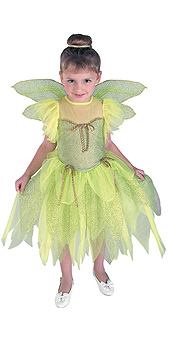 Your daughter can sprinkle fairy dust over all her friends and have loads of fun playing at being Tinkerbell in this oh-so-cute costume. It is made of yellow netting, with gold glitter detail, and is trimmed with golden roses and ribbon. Also included are the yellow fairy wings, held in place by golden elastic straps. Available in toddler, small, medium and large child sizes.